1) Software in the Sensor Modules. In the waggle architecture, sensors are composable and modular. The default Waggle Sensor Board uses an Arduino microcontroller to sample and calculate data points. Data from the sensors is sent to the Node Controller via a serial line. Other sensor modules could run their own embedded code and send data to the Node Controller via USB, I2C, or even Ethernet. 2) Software in the Waggle Cloud. Waggle nodes collect and the cache data locally. Data is then pushed via secure connections to a set of cloud servers. We call our set of cloud machines the “Beehive”. For ease of deployment, the Waggle Cloud software is packaged into a virtual machine. 3) Software in the Node Controller. 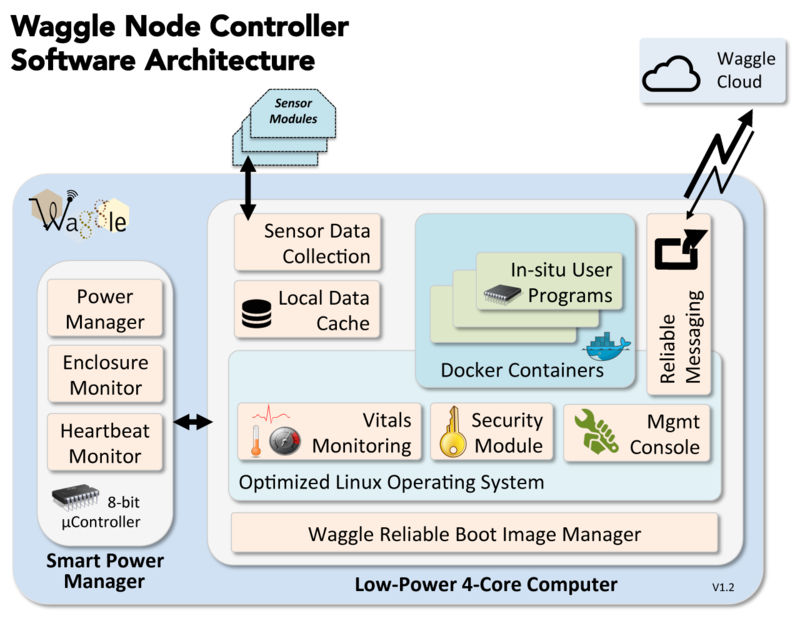 The picture below shows a block diagram of software components in the Waggle Node Controller. A description of the components is provided below. The Peach-colored boxes above are all parts of the Waggle software for the Node Controller.